The configuration above is pretty massive when you multiply it by the number of switchports on a given switch and the way it behaves in a sequential manner. - If the RADIUS server is dead, reinitialize to VLAN 100 and reinitialize the voice VLAN on the port. It makes sense and it's served us well for some time now but it's not very dynamic and the config bloat is real as you can see from the the above screenshot from my lab. So what does C3PL bring to the table that you can't get out of the previous configuration? It gives us the ability to dynamically define actions based on events in the session in response to specified conditions and events. If the conditions or events don't match, it won't even try to take that certain type of action that you define. The list of different events and conditions is pretty robust. Optimization - The configuration can exist in memory once and called many times. Doesn't operate in a serial manner like the previous configuration style. For example, you can have 802.1x and MAB running at the same time but specify a preferred authentication method (802.1x). This can improve the end user experience since they don't have to wait 10 seconds for 802.1x to fail before MAB even starts. Templates to control access if RADIUS fails such as a critical ACL instead of just dumping them into a VLAN. Note: If you do not clear the ports prior to this, it will convert all your existing ISE port configurations to individual C3PL policies and if you plan on creating a single consistent policy on a switch, you don't want it to automatically create a policy per port. 1. Control Class - This is where you initially specify the condition that needs to be seen to cause a control policy to be triggered. Think of it this way: If you were looking at a policy set in ISE, this would be the top-level condition that would need to be matched for ISE to select a certain policy set to use. With a control class, you can specify if all, some or none of the matching statements are true. Once the class is created, you can match or not match on a number of different conditions. It's pretty simple logic and you can get really interesting with what you can match as you can see in the screenshot below. So many options! In reality, we'll probably be sticking with a pretty static template but I could definitely see myself creating a policy based on a matched SGT to do some pretty interesting things. The above screenshot displays some of the many other options you have when configuring the above configuration. 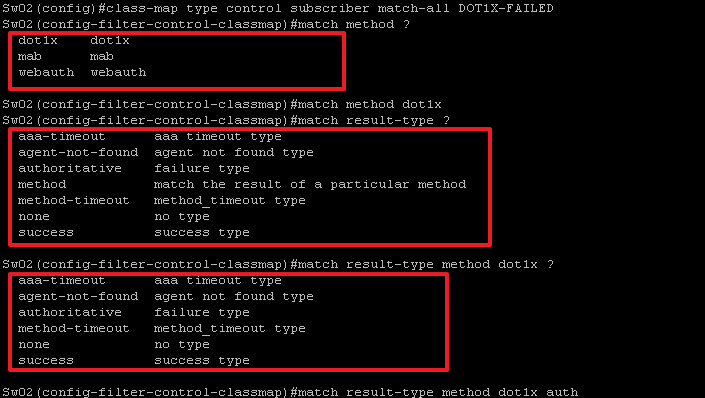 In the initial line of the class-map, I specify that it needs to match all the conditions in the class map to trigger. Then in the match statements, I'm telling it that it has to match the 802.1x method type and fail. The one thing that I think initimidates a lot of people with C3PL is that there are so many different options. In most cases, you're going to do a pretty static configuration but just to give you an idea of some of the cool options you have, look at the below screenshot. With so many options, you can end up configuring the wrong thing if you're trying something new but that's where testing your configuration should come into play. In the below, we could easily specify matching on webauth or mab, successful authentication, etc for some interesting triggers. 2. Creating your control policies - The control class that you created in step 1 are used in the control policy. The control class is the event that casuses the control policy to be evaluated and defines actions to take based on the event in the class map. The actions you can take are specific to what kind of event occurred. Note: The different between match-all and match-first is that with match-all, you evaluate all of the classes you define and with match-first, you only evaluate the first class it matches. Note: Here is where you can specify you class name you created in step 1 or you can specify always to ensure that the control class-map always matches. For the second argument in the above configuration, you can have it execute all the actions you specify, all of them until it fails, or all of them until it's successful. Here is where you can specify the action to take including to activate a template or policy, authentication type and priority, authorize a session, notify the session attibutes, set a timer, and unauthorize a session along with a number of additional arguments depending on what type of argument you are making. Note: This ACL could be as restrictive or as liberal as you want it to be. The point is to craft it for your organization. event session-started match-all <- States that if a session starts, match all the below that we define. 20 authenticate using mab priority 20 <- Action is to authenticate using MAB with priority of 20 - making it a lower priority than a successful dot1x authentication if both were to pass authentication. Now when you look at the switchport configuration, it's a lot smaller and tighter in comparison to the first switchport configuration I posted.